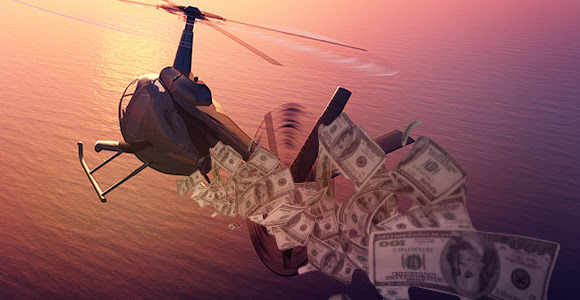 Allianz SE Chief Economist explains the negative side of helicopter money .. "There are major downsides to helicopter money. Most important, by enabling the monetization of unlimited amounts of government debt, the policy would undermine the credibility of the authorities’ targets for price stability and a stable financial system. This is not a risk, but a certainty, as historical experience with war finance – including, incidentally, in Japan – demonstrates only too clearly .. A Central bank would struggle to defend its independence once the taboo of monetary financing of government debt was violated. Policymakers would pressure it to continue serving up growth for free, particularly in the run-up to elections. Even if central banks did retain their independence, it is doubtful that they would be able to steer inflation gradually to, say, 2%, and then keep it there. Dispensing liquidity to spur inflation is much easier than draining it to prevent price growth from spinning out of control .. It is time to recognize, once and for all, that governments, not central banks, are responsible for generating long-term employment and growth, by ensuring favorable investment conditions, a high-quality education system, and open, competitive markets. Monetary policymakers should defend this red line – which means keeping the helicopters on the ground."